In 1982, Cold War tensions led to growing concerns about Soviet and Cuban influence in Central America. 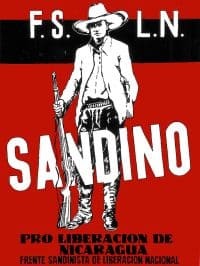 Following the overthrow of Nicaraguan dictator Anastasio Somoza, the Sandinista National Liberation Front (FSLN) took power and began supplying Soviet weaponry to Salvadoran guerrillas. 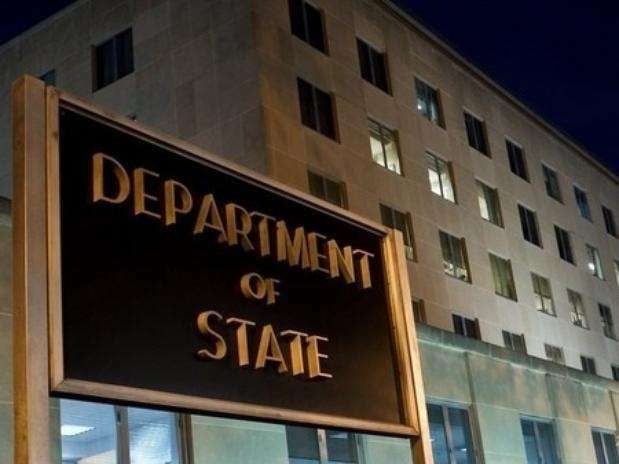 Secretary of State Al Haig urged that evidence of this be released to the media; however, the information could not made public because of intelligence sources. In the midst of this, the Salvadoran Army captured a 19-year-old guerrilla fighter, Orlando Tardencilla, who claimed to have been trained in Cuba. Certain that this was the smoking gun which would prove beyond a shadow of a doubt that Cuba was meddling in El Salvador, the U.S. flew Tardencilla to Washington for a March 12 press conference. However, Tardencilla quickly recanted his story, claiming he had been tortured. This proved to not only be embarrassing for the State Department, but it raised yet another problem: What to do with Tardencilla? Return him to El Salvador, where he was reportedly tortured? Hand him over to the Nicaraguans, who would greet him as a hero? Grant him asylum in the U.S., after he lied to American officials? Lino Gutierrez, the Nicaraguan desk officer at the time, was the only regional bureau person in the hours-long meeting to decide what to do with Tardencilla. You can read about when Al Haig declared “I’m in charge here” and his run-in with the ambassador over U.S. policy in El Salvador and with an FSO who quit because of disagreements on bombing Cambodia. Go here to read Jack Anderson‘s 1982 column on the incident. 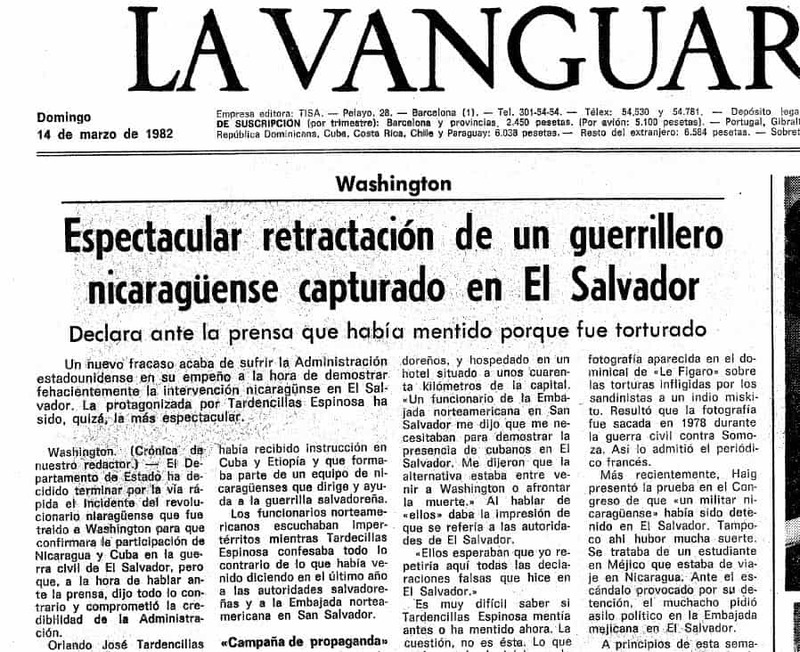 GUTIERREZ: At that time we were getting all kinds of intelligence reports about Soviet materiel arriving in Nicaragua. There were reports that they were bringing in tanks; they were bringing in Cuban military advisers, not only teachers, but people like General Arnaldo Ochoa, who was the Cuban hero of Angola, and executed by Castro a few years later. He was in Nicaragua…. 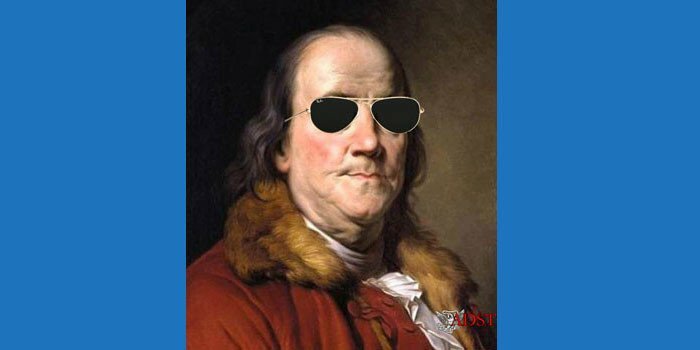 [because] he was becoming too prominent a figure in Cuba. Fidel does not like competition. Cuban intelligence recorded conversations where Ochoa criticized the regime…. There were also rumors about Nicaragua acquiring MiGs [Russian fighter aircraft], but the country did not have the runways that MiGs required to land. They did receive tanks and other Soviet materiel. But it wasn’t as much the arms as their intentions. While they still paid lip service to democracy and allowing a mixed economy, they were harassing the opposition and putting them in jail. They continually censored and occasionally shut down La Prensa, the only opposition newspaper that remained. The Sandinistas were also suppressing the Miskito Indians on the Atlantic coast, who had a very independent streak. They continued to ship arms to the Salvadoran guerrillas. Internally, they were moving toward a totalitarian system. The trends in Nicaragua were not good….The provision of weapons to the Salvadoran guerrillas was a major concern. We knew that it was happening from our intelligence, but we could not share what we knew because of sources and methods. 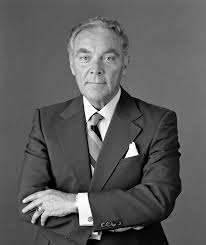 Secretary of State Al Haig (pictured), for one, kept urging us to get the evidence out, get the evidence out. This led to a very famous incident in which I played a part, the Tardencilla affair. What happened was that the Salvadoran Army picked up a guerrilla fighter in El Salvador, a prisoner of war. When they interrogated him, they found out he was born in Nicaragua. Orlando Tardencilla was his name. When they questioned him further, he revealed, supposedly, that he had been trained in Cuba and had served in Ethiopia. The Salvadoran Army passed that information to us. Someone then decided that this was just the evidence that Secretary Haig was looking for: A Cuban-trained Nicaraguan who was fighting with the Salvadoran guerrillas. This would definitely prove Nicaraguan involvement in El Salvador. The decision was made to bring Tardencilla to Washington. As far as I know, our bureau was not consulted – I don’t know if the decision came from the White House or from elsewhere in the State Department. So Tardencilla was flown to Washington, and a press conference was called to show off Tardencilla and to expose Nicaragua’s involvement in El Salvador to the U.S. press and public. A few hours before Tardencilla was to be brought before the press, our bureau was informed that the event was about to happen. I recall that [Assistant Secretary of State for Inter-American Affairs Thomas] Enders sent Tony Gillespie, who was his Special Assistant, to be part of a group that questioned Tardencilla before he went before the cameras. I was not asked to participate, nor was anyone else in the office of Central American affairs invited. You can imagine the reaction; the press had a field day ridiculing the administration. Not only that, but the U.S. Government had a total mess in its hands. They had this supposed — well, this guerrilla who had recanted on his testimony. By now, every news organ in the U.S. had the story. Congressional opponents of the administration were threatening to hold hearings about Mr. Tardencilla, and even asking him to testify. The administration then faced a dilemma: what to do about Tardencilla? You couldn’t send him back to El Salvador after he alleged that he was tortured – the human rights groups would have crucified us. Could you set him free on U.S. soil? Would he then apply for political asylum? It was quite a mess: some in the administration foresaw at least a month of constant criticism in the press for its Central American policy. I remember that my wife was supposed to pick me up at 6 p.m. I went to the meeting, and when the meeting was still going on at 6, my wife had arrived, so I came out and said, “Would you wait for me in my office, because I think this is going to go a little longer?” Luckily my mother was in town, and she was staying with us and could watch our two daughters…. The lawyers were trying to figure out that the U.S. could legally do with Mr. Tardencilla. Should the U.S. send him back to El Salvador? Keep him in Washington? Try him? Their instructions had been to find a solution that would make the problem go away. Of course, every time lawyers get involved, things move slowly….There were lawyers who were responsible for our Latin America policy, others from the human rights section, others who handled cases involving prisoners of war, all from different parts of L [Office of the Legal Advisor],…internal U.S. government lawyers who were in touch with counterparts at other agencies. I was the only regional bureau person there, although there were, I think, people from the Secretary’s office and other parts of the State Department. Even though the Salvadoran government wanted Tardencilla returned to them, that option was ruled out because Tardencilla claimed he had been tortured by the Salvadoran authorities, so how could we explain the fact that we were sending him back to a place where he had been tortured? Returning Tardencilla to El Salvador was out of the question. But if we did not return him to El Salvador, was he a free man? Surely the opponents of our policy would then get a hold of him and parade him around town making speeches against our policy. There seemed to be no good solution of what to do with him…..
And by then it’s like 7:00 or 8:00 at night. And I made the suggestion, what if we hand him over to Nicaragua? Some of the participants immediately rejected the idea. Surely Nicaragua would treat him as a hero and gain a propaganda victory. My response was better to have a propaganda event in Managua than in Washington. But what if we turned him over to the Nicaraguan embassy and they held a press conference? I knew the Nicaraguan ambassador, Francisco Fiallos, very well. He had come from the private sector, and from some of his comments I suspected he was not as sympathetic to the Sandinistas as his office required (later he defected)…..I knew that I could trust Fiallos to a certain extent. So we kept debating for hours whether we should or could legally contact the Nicaraguan embassy or not. By 11 pm the participants agreed to allow me to contact the Nicaraguan embassy to try to work out a deal: we would turn Tardencilla over to the Nicaraguans. They would buy a plane ticket for him to get him out of the country, back to Nicaragua as soon as possible, and they would promise not to hold any press conferences or make any propaganda statements here in the U.S. Many on our side were skeptical that the Nicaraguans would respect any agreement. All I could tell them was that I knew the ambassador, and I was pretty sure I could trust him to keep his word. So I called Ambassador Fiallos, late at night, got him of bed, and explained our proposal to him. He said he would get back to me. Within the hour, he had consulted Managua and called us back. He said, “If you turn him over to me, we will assume responsibility for him when he’s transferred. I guarantee that he will be on the next plane out, and we’ll make no statements here.” Well, again the lawyers had to cross the t’s, dot the i’s, and inform their superiors. Everybody eventually agreed. So, about 3:00 in the morning, I went down to the C Street entrance [main entry for the State Department]. A couple of unmarked white cars drove up to the State Department entrance, out came Mr. Tardencilla and his U.S. Government escorts. He was dressed very “preppily,” as I recall. I guess we had paid for a new wardrobe for him. Ambassador Fiallos arrived shortly afterward. We met in one of the conference rooms of the State Department, shook hands, and turned Tardencilla over to the Nicaraguans. He was happy to go, having no interest in staying in the U.S. under any circumstances…..
[This was] at 3:00 or 4:00 in the morning. My wife had fallen asleep on the couch in my office. We did the hand-off inside the State Department, and they found a flight to Chicago early in the morning, and then Chicago to Mexico City, and then Mexico City to Managua, and he was out…. Nobody said anything. It made the press a day or two later. “Tardencilla back in Nicaragua.” And there he was given a hero’s welcome, but we avoided more embarrassment for the administration…. They gloated a bit in Managua once Tardencilla arrived, but we avoided a month of our critics gloating in Washington. We also avoided weeks of more adverse press, interviews, and Congressional hearings.